12 Months - $39.99 Only 6 left! The last decade hasn’t been very great for our planet’s most proactive pollinators and, ever day we go, we seem to be closer to watching the poor guys vanish. They’ve got such a bad rap, so often confused with their terrible, evil cousins, the "Doomstings", the "Buttdaggers", the insidious and human-hunting wasps! You’ve been on the Internet. You’ve seen the anatomy cross-sections, detailing the seething hate that fills the wasp compared to the delightful and fuzzy, happy-go-lucky and sweet nectar-transforming honeybees. Why, you could take action! You could help save the world. With one simple choice, you could completely set right the flawed image that the poor bees have somehow locked into the minds of so many on the planet. Stand up and buzz out loud the message of how adorably sweet and innocent the little guys are! Save the newest generation! In fact, they can probably help out… We're sure that you heard of 'worker bees.' They are some of the most hardworking creatures alive! Of course, you want to still your little one with diligence as soon as possible. 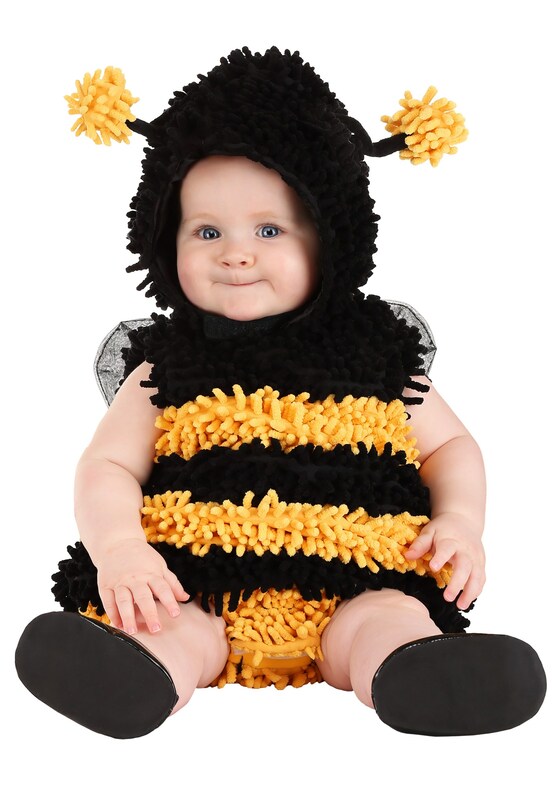 With the Baby Stinger Bee costume, you can transform your little babe into the fuzzy bee and show the world that there’s nothing to fear. A comfy and fuzzy polyester chenille knit costume of alternating black and gold stripes, the outfit proper will highlight every sweet inch of your youngster and the fiberfill stuffing will only make them look chubbier. Mesh wings and a stinger that’s more fuzzy than it is dangerous completes the look and will have everyone rethinking their stance on the little honeybumblers!